A good ole tray of roasted veg isn't just for autumn and winter. Loaded and adorned with herbs, spices and nuts, roasted vegies are something to be enjoyed just as much when the weather warms. These dishes work as a side or as the main star of your meal. All recipes serve 4 as a side; 2 as a main course. If you can't find tamarind chutney for this recipe, use about 2 teaspoons of tamarind extract and double the amount of brown sugar to achieve a balance of tart and sweet. 1. Preheat the oven to 180C and line a large baking tray with baking paper. 2. Combine the sweet potato ingredients in a bowl and toss to coat. Turn out onto lined baking tray and roast for 35 to 45 minutes or until tender and brown. 3. Meanwhile, place the sambal ingredients in a blender, pulse briefly, and season to taste – don't blitz it too much that it turns into a paste, but the herbs and coconut should meld together. Set aside until ready to serve. 4. Combine the topping ingredients in a bowl. Taste and add a sprinkle of brown sugar if it is too tart (chaat masala spice mix can vary – some combinations include asafoetida which can add to the tang/sourness). 5. 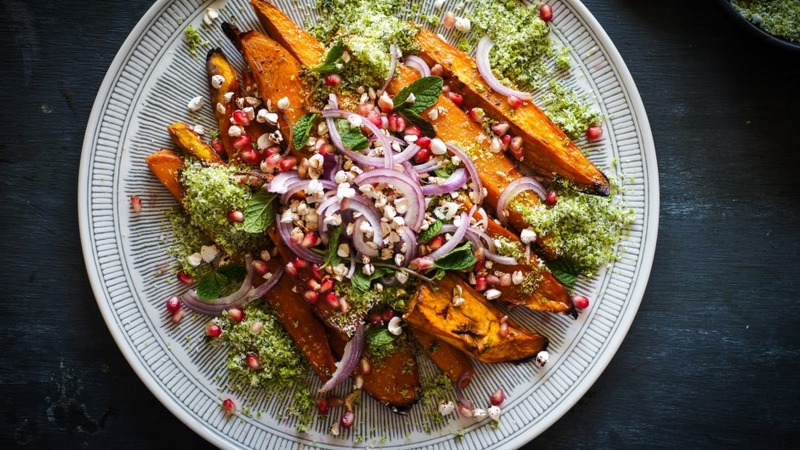 Place the sweet potato on a serving plate, top with dollops of coconut sambal, scatter the puffed buckwheat topping and serve. Take your sprouts far beyond the usual roasted with pancetta/bacon scenario. They are the perfect vehicle for a bit of sweet and heat. If your sprouts are on the larger side, halve them before cooking. If you don't want any extra kaffir lime roasted cashews (trust me, you really do) you can halve the quantity. 1. Preheat oven to 120C and line a baking tray with baking paper. 2. For the kaffir lime cashews, combine the ingredients in a bowl, tossing and mixing to ensure the nuts are thoroughly coated. Turn out onto the lined baking tray and roast for 40 minutes – toss the nuts twice during cooking to prevent them from catching. Set aside to cool completely. 3. Increase the oven heat to 180C. 4. 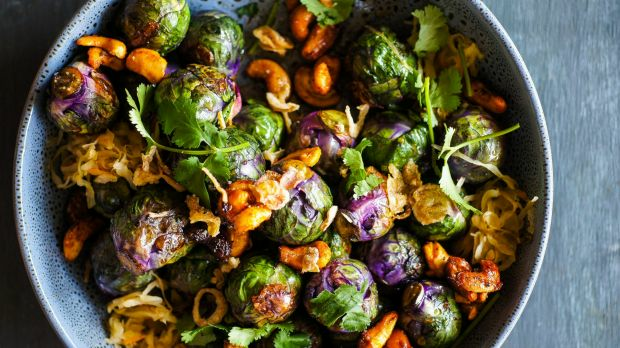 For the brussels sprouts, combine the ingredients in a bowl, reserving one tablespoon of ricebran oil, and toss to thoroughly coat the sprouts. 5. Place a medium, ovenproof frying pan over medium heat. Add the remaining tablespoon of ricebran oil. Once hot, add the sprouts and cook, tossing occasionally, until they start to brown (about 3 minutes). Place the frying pan in the oven and roast until the sprouts are golden and tender (about 15 minutes). 6. Pour the sprouts and any remaining juices into a serving bowl. Top with spoonfuls of kimchi, scatter the fried shallots, kaffir lime cashews and coriander leaves and serve hot. Fresh honeycomb is available from select grocers and delicatessens and is well worth seeking out. It has a floral brightness and chewiness that works wonderfully with the carrots and creamy salted ricotta. 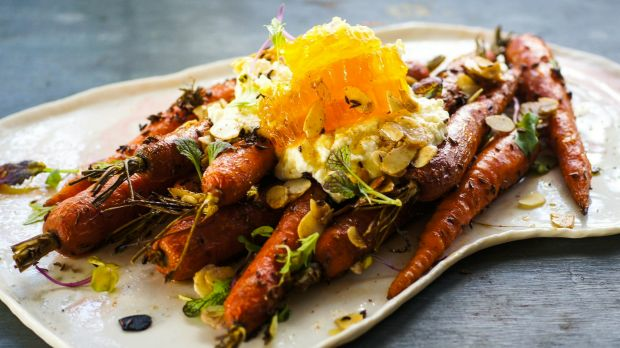 Alternatively, you can sparingly drizzle the carrots with regular honey. If your carrots are on the larger side, halve them lengthways to ensure they roast evenly. 2. Add the carrots to a roasting dish and drizzle with oil. Scatter over the caraway seeds, season with salt and pepper and toss to coat. Pour about 160ml water into the tray. Cover tightly with foil and roast for 30 minutes. 3. Remove the foil and cook for a further 15 minutes or until the carrots are tender and the water has completely evaporated. 4. Combine the salt flakes and ricotta in a bowl. Taste – you should notice the salt flavour but not have it completely overpower. Adjust the seasoning as required. 5. Turn the carrots out onto a serving platter. Top with the salted ricotta and chunks of honeycomb, torn into pieces. Scatter over the microherbs (if using), season with salt and pepper and serve warm. 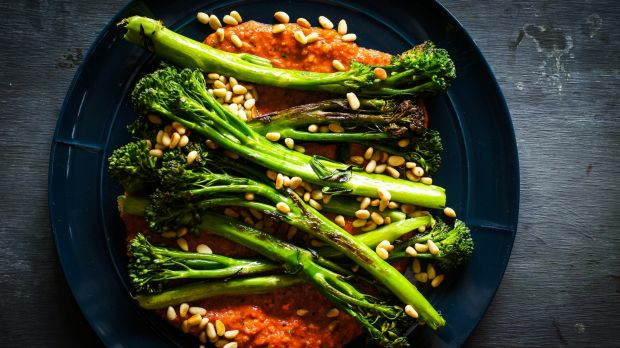 Broccolini is the kind of green that is good enough to eat on its own, all the while being hospitable enough to share the limelight; accentuating and complementing all kinds of add-ons, like this light, herbaceous and spicy romesco. Add some toasted nuts and this is a tick-all-the-boxes kind of dish. This recipe makes 4 cups of romesco, more than you need, but it keeps well in the fridge and is all kinds of useful: toss it through pasta, slap it on a ham sandwich, dollop it on roast chicken or grilled steak or serve with some crudites to snack on. 1. For the romesco, preheat the oven to 210C. Place the capsicums and onions on a baking tray lined with baking paper and roast for 15-25 minutes or until the capsicums are charred and beginning to blister. Turn the veg midway through roasting. 2. Allow the capsicums to cool slightly, then peel off the skins and remove the seeded core. Add the onion, capsicum and any juices to a blender with the remaining romesco ingredients and pulse until fully incorporated. Taste and adjust seasoning – it should be spicy and slightly acidic. Reserve 1 cup and store the remainder in the fridge for up to two weeks. 3. For the broccolini, toss the broccolini in the olive oil and lemon juice. Place an ovenproof frying pan over medium heat, add the broccolini and cook on each side for 1 minute until it gets some colour. Flip the stems over then place the frypan in the oven for 2 to 3 minutes or until cooked to your liking. 4. Dollop the romesco generously over a serving plate. Top with the broccolini stems and scatter with pinenuts. Season with salt and pepper and serve warm.